Explore these Sgt Hack Videos: Virtual Tour of US WINGS, The BALLAD OF SGT HACK, Purple Heart Ceremony, the Vietnam 50th Anniversary Veterans Radio Network Interview and the Cantigny 1st Division Oral History Project. Learn more about US Wings and its founder and CEO SFC David Hack, US Army (Ret). Take a Virtual Tour of US WINGS headquarters and retail store located in Boston Hts. Ohio. Your tour guide, Ernie Sedlak is led by Sgt. David Hack, CEO of US Wings. Come explore the wide variety of outdoor apparel and military accessories. Located adjacent to the Ohio Turnpike, and very close to its new neighbors, Costco and Bass Pro Shops. The music video, “The Ballad of Sgt. Hack” was shot by singer/songwriter Erica Lane and producer-director Kenny & Kyle Saylors. The shoot took place in various locations around Hudson OH using many local residents as cast and crew members. The Ballad of Sgt. Hack was based upon the book, “The Life of a Warrior”. It tells the story of Sgt. Hack growing up in Kentucky and his military service. A Purple Heart Ceremony was held June 30 2011. SFC David D. Hack (US Army Retired, CEO of US Wings) was presented with the Purple Heart Medal for wounds he received during the Vietnam War. Presenting the medals were Congressman Steven LaTourette (R-OH), LTG (R) Robert Wagner USA (Ret), and Bill Willoughby (Civilian Aide to the Secretary of the Army OH-N). Sgt. Hack earned two Purple Hearts during his tour, which were noted in his DD-214 file, but due to military oversight he never received the actual medals. Sgt. Hack was wounded the first time on April 10th 1968 in a rocket attack. He was wounded the second time September 13th 1968. Sgt. 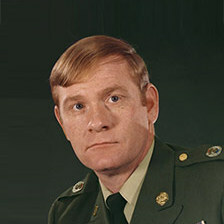 Hack’s Vietnam service ended in 1968. 43 years later, he finally received his Purple Heart (along with a Good Conduct Medal, National Defense Service Medal, Vietnam Service Medal with three bronze service stars, Republic of Vietnam Campaign Ribbon, Expert Badge with Rifle Bar, and an Army Recruiter Badge). Gary Lillie of the Veterans Radio Network interviews SFC David Hack, Lt. General Robert Wagner and Major Bill Willoughby all USA (Ret) about their experiences in Vietnam. Ball State University Professor of History, Dr. Michael W. Doyle Phd, interviews SFC David Hack, USA (Ret) as part of the Cantigny First Division (Big Red One) oral history project.